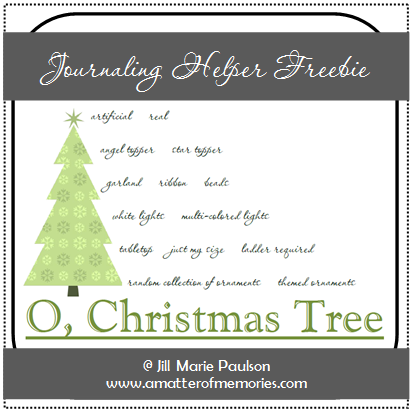 Here's a journaling helper to help you record your holidays. Simply print it out and indicate the words or phrases that describe the Christmas tree that decks your halls. You can circle, underline, highlight or use any method you desire to designate your trees descriptors. You can let the journaling helper speak for itself OR you can include additional journaling to explain your choices. For example, why do you prefer a real or artificial tree, white or multi-colored lights, etc.